In 1990, San Luis Obispo became one of the first American cities to pass a ban on all indoor smoking in restaurants and bars. While commonplace today, the strict regulations were a novelty then, earning a mention in the Los Angles Times as one of the "nation's toughest" tobacco laws. So stringent was the new law that then-bar owner, the late Joe McCarthy, worried it might put him out of business. SMOKE E-cigarette products, like the ones show above, have never been more available in SLO County. "Almost every customer I have smokes," he told reporter Miles Corwin. "I tell some of these guys they can't smoke, they'll just find a bar in another city." McCarthy's is still in business 28 years later, and nearly every city in California and beyond has adopted the bans that seemed radical all those years ago. But while SLO was once a pioneer in tobacco regulations, it and the rest of SLO County have now fallen behind, in part due to the rise of electronic smoking products, which are outpacing state trends in both availability and use among youth under the age of 21. "This is the cigarette for a new generation of addicts," said Inger Appanaitis, an epidemiologist and program manager for the SLO County Health Agency's Tobacco Control Program. In 2016, the program surveyed nearly 100 tobacco retailers in SLO County, including gas stations, smoke shops, convenience stores, and other businesses that sold smoking products, and found that 89 percent of them offered e-cigarette products. That number was higher than any other county in state and nearly 30 percent above the state average. In addition, the availability of e-cigarettes has grown over the last several years. The number grew more than 20 percent since 2013, according to the program's data. While the numbers are high, Appanaitis said they did not surprise her. E-cigarette use across the state has been going up, and smoking rates in SLO County have generally been higher than the state average, she said. E-cigarette product use has risen as their use has been billed as a safer alternative to smoking for adults and also as a way for smokers to wean themselves off of traditional cigarettes. But Appanaitis and others worry that the products are actually targeting a different demographic: young people under 21. "One of our objectives is to reduce the availability of e-cigarettes, because they are a threat to our youth," she said. "This is one of our highest priorities." 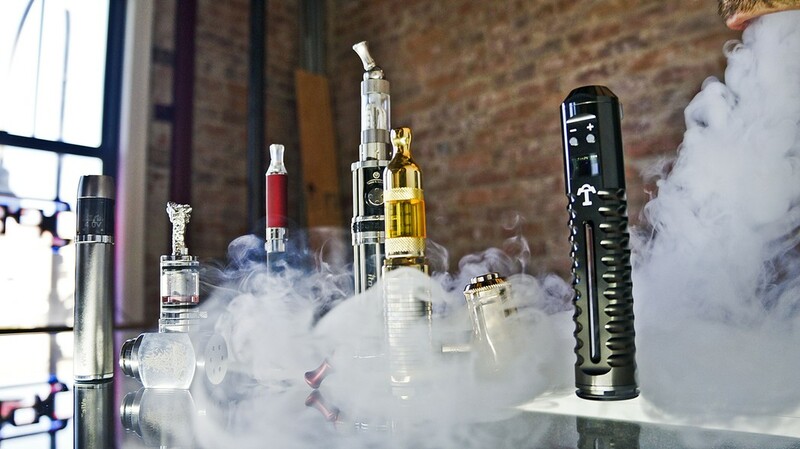 Appanaitis said that many e-cigarettes and vaporizers offer various flavors that might appeal to children and teenagers. There are hundreds of "juices" for such devices in flavors like cotton candy, butterscotch, and caramel cappuccino. They are often marketed in brightly colored packaging, which is another way they might appeal to children, she added. "Some of those flavors are not targeted for adults who are looking to quit smoking," Appanaitis said. In SLO County, the rise in popularity and availability of e-cigarette products appears to have coincided with a rise in use among underage youth. According to the 2016 California Healthy Kids Survey, which a sample of students from school districts across the state take part in each year, an estimated 14 percent of participating 11th graders in SLO County reported using an e-cigarette product at least once, more than twice the number of those who reported using traditional cigarettes, and four times more than those who reported using smokeless tobacco products like chewing tobacco. "A lot of young people are trying tobacco for the first time in this form," Appanaitis said. While the smoking age in California is 21, that fact doesn't seem to keep those products out of the hands of underage SLO youth. The SLO County Health Agency's Tobacco Control Program helps conduct enforcement operations on local tobacco retailers. According to Appanaitis, an estimated 10 percent of the state's tobacco retailers have illegally sold to minors. In SLO County, that number is higher. "It's not great. I know we are above that," she said. "Generally, we are closer to 12 or 15 percent." To help reduce e-cigarette use by minors in the county, Appanaitis said that local cities and the county could pass stricter regulations, particularly ones limiting or even banning the use and sale of flavored e-cigarette products. She also cited a recently passed smoking ban at Cal Poly, and a similar ban reportedly in the works for Cuesta College, as positive steps to return SLO and other cities in the county to their status as leaders in fighting against the use of smoking products. "SLO was the first city in the world to ban smoking in restaurants and bars," she said. "Even though we achieved that milestone, we don't have as strong tobacco control laws compared to other cities and counties in California." E-cigarette proponents have pushed back on some of the concerns voiced by Appanaitis and others, indicating that some of the fears and scrutiny coming from the media and government regulators is an emotional reaction. "The e-cig looks like a traditional cigarette but that is where all similarities end," the Tobacco Vapor Electronic Cigarette Association (TVECA), a nonprofit industry trade group, stated on its website. "People mostly have a very visceral reaction to traditional cigarettes, and the e-cig will share in that emotion until one looks further into what this technology encompasses." Staff Writer Chris McGuinness can be reached at cmcguinness@newtimesslo.com. Follow him on Twitter at @CWMcGuinness.